My taste buds are having an argument with my mind recently. It’s hot out (well, ok, not this week, but when I drank this it was). In my mind, I want crisp white wines. However, my taste buds have been crying out for Syrah…I can’t get enough of it. I suppose that’s actually a good thing given the prevalence of red wines in my cellar versus white wines….really need to do something about that. I picked up tonight’s wine at The Winery in downtown Alexandria. I asked Jane, the owner, if she had anything new in that I’d like and she immediately pulled out this bottle, so I took a chance on it. 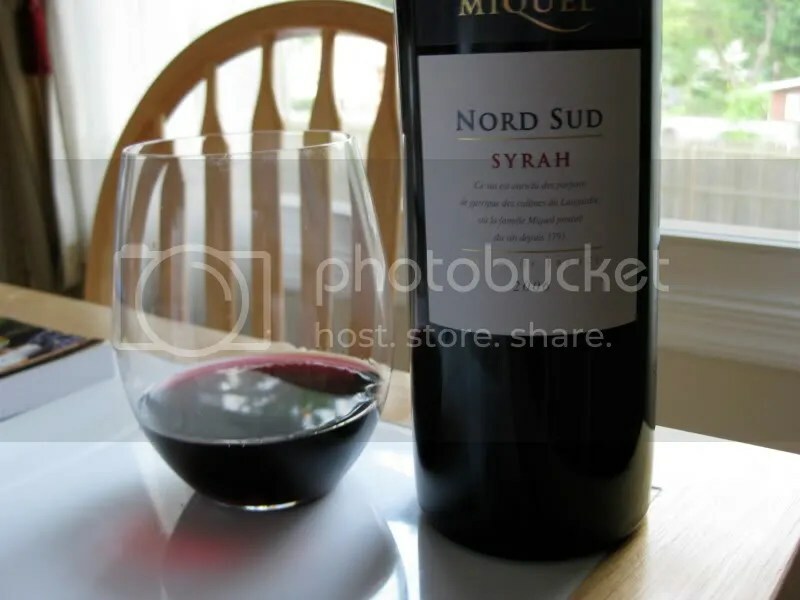 The 2006 Laurent Miguel Nord Sud Syrah from the Languedoc in France cost me $12.99, had a plastic cork closure, and clocked in at 13.5% alcohol by volume. Pepper pepper pepper! Wow did the nose of this one have a lot of pepper! Under the pepper I found violets, spice, black cherry, fresh plum, vanilla bean, cream, and blackberry. YUM! In the mouth I got black pepper, smooth black cherries, black plums, blackberries, strawberry, spice, a meaty quality, and a tiny hint of chocolate. I loved the tart fresh fruit flavors and the mouth coating feel of this wine. At this price, a bargain and a half, scoop it up and enjoy! At times, I drink a wine, and think, this wine is fine. Nothing wrong with it at all and I wouldn’t say no if someone offered me a glass, but it’s just not something that grabbed my attention in any way. It didn’t make me sit up and say “Wow, I love what’s going on in this glass.” And that’s fine, there’s certainly a place for those kinds of wine as not every occasion calls for deep contemplation of the wine in your glass. Anyway. 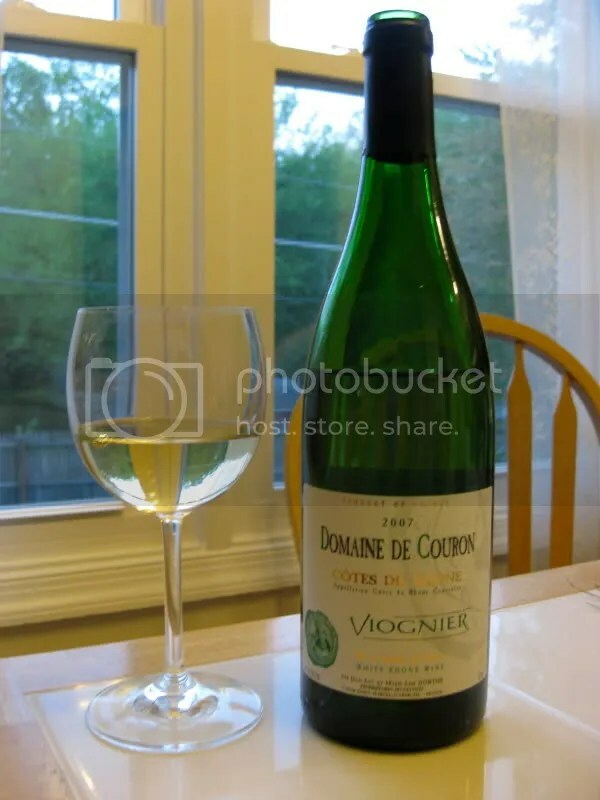 I purchased the 2007 Domaine de Couron Viognier at The Winery in downtown Alexandria while out hunting for an Albariño to take to a Spanish wine tasting. It caught my eye as something new on the shelf so I thought I’d give it a try. I think it had a a real cork, clocked in at 14.5% alcohol by volume, and cost me $15.99. I found the nose to be extremely aromatic, with flowers, tangerines, honeysuckle, lemon, melon, and figs. In the mouth I got minerals, stones, lemon, apricot, tart citrus, and melon. The wine showed as crisp, clean, and dry. I thought the alcohol seemed a bit high and showed a bit, especially on the nose, but did integrate as the wine warmed a bit. 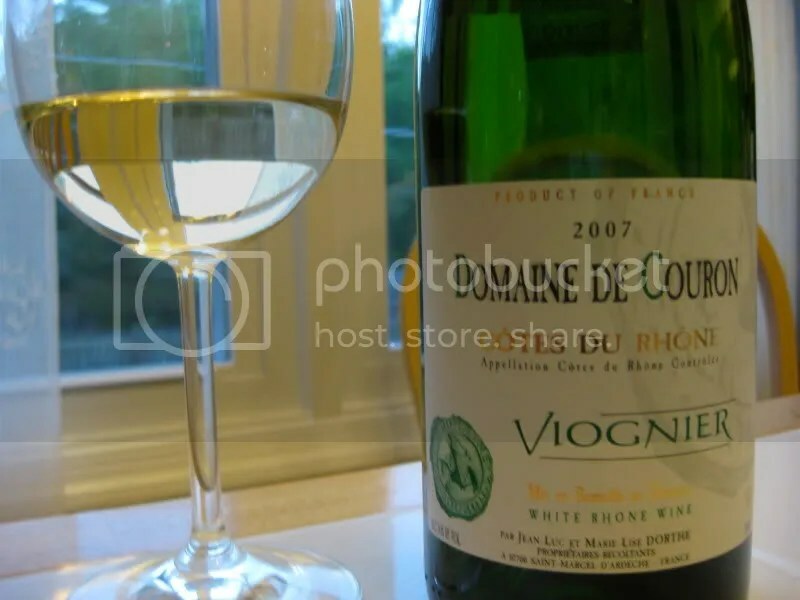 It is a perfectly drinkable wine, it expresses a typical Viognier profile, and it’s not a bad price. I’d drink it if someone handed me a glass. The wine was a 2005 Siema Rosso Vino da Tavola by Lodali Winery from Piedmont. Sorry, I seem to have not taken a picture of this one. The wine clocked in at 12% alcohol by volume and cost me $8!!!! at The Winery in Old Town Alexandria. It’s a blend of 50% Barbera and 50% Dolcetto. I believe I took more notes on this wine than almost any other red wine I’ve had in recent memory. I’m still shocked at the layers and depth in this little $8 bottle of wine. What I should have done was go buy the rest that The Winery had because this was simply an amazing value. The nose showed smoke, leather, a little barnyard, red berries, and red currants. It kept opening up as the night progressed and the smell was amazing. In the mouth the wine was red and earthy. I found red berries, red currants, earth, leather, a smoky characteristic, and more red fruit. This was just an absolutely fabulous deep wine with layers of flavors. Everyone loved this one at our dinner party. I served it with homemade pizza, and in addition to everything else, the wine was wonderful with pizza! The smoky flavors were perfect for the cheese and pepperoni covering the pizza. Which to me means we have shifted almost entirely away from the heavy reds I love so much for the winter and into the Sauvignon Blancs, Roses, Gruner Veltliners, Albarinos, and, oh, who are we kidding, any crisp white wine that will beat the heat and humidity that comes from living in a swamp. With that in mind, the wine for the evening was a 2007 Ken Forrester Sauvignon Blanc. The wine had a screw cap closure, hailed from Stellenbosch, South Africa, clocked in at 13.5% alcohol by volume, and cost me $14.99 at The Winery in Old Town Alexandria. Dominate on the nose of this one was asparagus. There was no mistaking that one!. Other aromas were grass, gooseberries, lime, and a touch of pepper, the vegetable kind! In the mouth I found lime, gooseberries, citrus, grass, and more of the green pepper. This was a very tasty and spicy (because of the pepper) Sauvignon Blanc. Perfect for the weather and great with all the lighter cold pasta salads and white fish we’ll be eating all summer long! The wine for the evening was a 2006 Devil’s Corner Pinot Noir which I served in our schmancy new Reidel stemless glasses. The wine hails from Tasmania, clocks in at 14.5% alcohol by volume, screw-cap closure and cost me $16.99 minus a 10% case discount at The Winery in Old Town Alexandria. I’ve never had a wine from Tasmania before! On the nose the wine was spicy and herbal, with leather, pepper, oak must, and perhaps a tiny bit of cherry, but that was barely there. In the mouth I found tart cherry, raspberry, leather, and earth. The wine was tannic, so perhaps it needs a little more time to mellow out. Overall, a decent Pinot Noir for the money. I picked up this bottle of 2006 Ruvei Marchesi di Barolo Barbera D’Alba at The Winery in Old Town, Alexandria for $18.99 minus a 10% case discount. It clocked in at 13% alcohol by volume and had one of those terrible plastic cork closures. On the nose I found cherries and leather. The nose was sweet with spicy undertones. 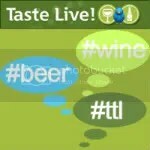 In the mouth I got flavors of dark cherry and spice. The wine was lighter in the mouth than other Barbera’s that I’ve had. It didn’t have as much going on as similarly priced bottles either. 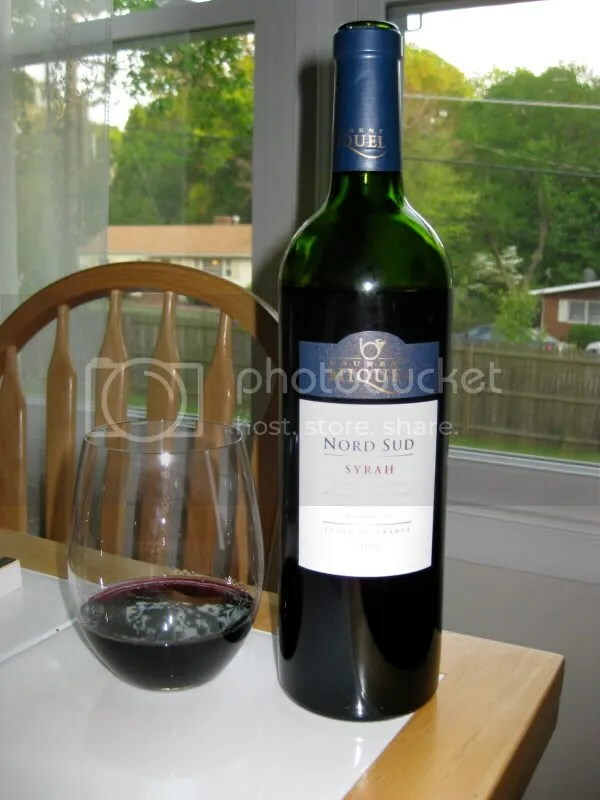 It was a nice quaffing wine, but look for other bottles in the same price range that offer a better value. Many thanks to Andrew of Spittoon who is hosting this iteration of WBW, with the theme “Just Seven Words.” Andrew asked us to choose an Italian red, any Italian red, and put our tasting notes into just 7 words that are grammatically correct. Riding horses through eucalyptus and berry fields.